Attributes are database extensions or controls that can be attached to any master record. They are normally used to track information that is outside of the master record and in some cases for control purposes to meet restrictions and regulations that affect how you do business. In a marketing environment attributes can track participants and their individual results of a marketing promotion or advertising campaign. In a service environment they can track service contracts, expiration dates, and amount of contract. In regulated business they can track licenses, requirements, as well as, business restrictions by geographical area. Field 2. Enter up to five warehouses to exempt from Restricted Attributes. However, based on your sales and shipping policy, there is nothing to keep the exempt warehouses from doing business in the areas and with customers where restrictions apply. This is the global setup for Item Hold, which allows users to place items on hold. Item Hold allocates the inventory without having to place an order for the item. Field 1. Turns Item Hold Processing on and off. Select “Y” to use. 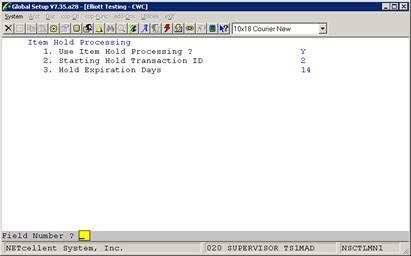 can press a function key for the next sequential number when entering a hold transaction. Field 3. Enter the number of days you wish the transaction to hold the inventory before it expires. This can be a number from 1 to 999.
eContacts is a CRM database designed for e-mail programs and web site authentication. Management and system users can easily and efficiently develop a feature rich and robust user database for their web site and use it with 3rd party applications, Elliott Software and Elliott Web Solutions. 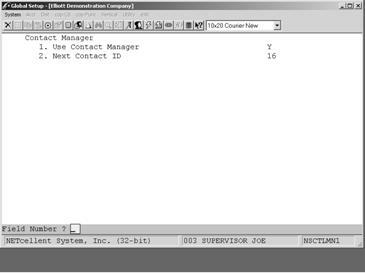 eContacts integrates to Elliott Software, Elliott Shopping Cart, Notes, and is the database for the Mass E-Mail program. The only requirement to using eContacts is a contact e-mail address. The advantages and rewards of eContacts are further enhanced by the Mass E-Mail Program. Users should read the Mass E-Mail chapter to better appreciate this CRM database and its structuring. Field 1. Turns eContacts off or on. Select “Y” to use. Field 2. Enter starting Contact ID number. This is an internal control only and serves no functionality or purpose to the user. Links allow the user to attach external files to records within Elliott. These can be jpg files with a picture of the item or customer, Word documents that may be a support or pricing contract or a file on the internet, like a webpage. The following allows the global setup for links. This setup screen allows you to set certain global variables for the General Ledger module. Field 1. Enter “Y” to have Elliott prompt for a Job Number when making journal entries in General Ledger. This setup screen is the same setup screen that appears in the General Ledger module. 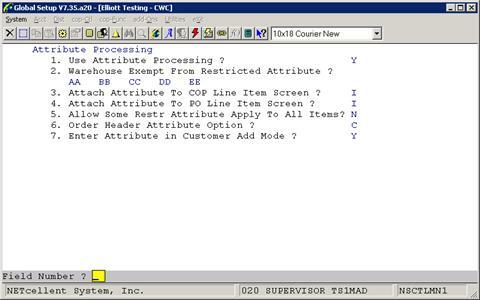 Procedure: Enter values for the prompted fields. This setup screen allows you to set certain global variables for the Accounts Receivable module. Field 1. By selecting “Y” to this field, Elliott can auto assign tax codes to customers and ship-to’s. A “Y” will cause two additional fields to display in State File Maintenance, Taxable Tax Code and Non-taxable Tax Code. Based on this information, when the state and/or region matches an entry in the State File, the tax code will be used as a default when entering a customer or ship-to. Field 2. Enter a three character tax code. This will be the default non-taxable code when adding a new record to the state file if the Auto Assign Tax Code flag is turned on. There is no error checking for this field, so be sure the code exists in the Tax Code file. Field 3. By selecting “Y” to this field, Elliott will display a City column and a State column in the lookup window. Field 5. Selecting “Y” to this field will enable Elliott to display a cross reference table when entering the city, state or zip code for a customer. If you are on the city field, then pressing F7 will allow you to enter a zip code and display the zip code, city, state and county for each zip code in numerical order. If you are on the state field, then you can press F7 to lookup states by abbreviation or F8 to look them up by name. By pressing F7 on the zip code field, Elliott will display a lookup window of zip codes, cities, states and counties sorted by city. The zip code file is supplied with your Elliott installation, but the state file is maintained by the user under Maintenance and State Table File. Field 6. Selecting “Y” to this field will enable the Customer Number Sequencer. When adding a customer you can press the F1 key to obtain the next available customer number. Field 7. This is the next sequence number for the Customer Number Sequencer. When adding a customer and pressing the F1 key, this number will appear as the customer number. Field 8. By turning on this flag, Elliott will allow you to perform a cash receipt and apply it towards an invoice that has not been posted. Field 9. Either “F” for Full Pay or “P” for Partial Pay can be entered. Full Pay means that commission will be calculated only on invoices that are fully paid. Partial Pay means the commission will be calculated on all the cash receipts, regardless if the invoice is fully paid or not. Field 10. This is the default path for the Customer Copy To Company feature. The Customer Copy To Company feature is a special function of Customer Maintenance. Field 11. This field has been made obsolete by eContacts. Field 12. Normally, statements should not be allowed to print to disk. There are exceptions to this rule, so we have provided a Y/N flag to allow for this. Field 13. 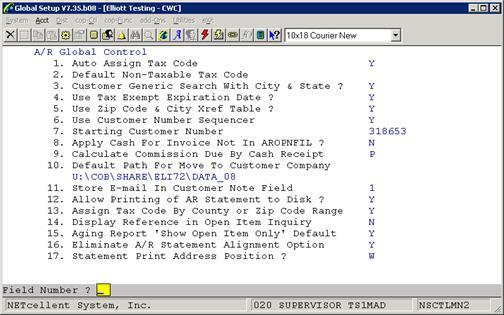 Indicate “Y” to assign tax codes by county and “N” to assign tax codes by zip code range. The tax code found will be the default value when adding a customer. Field 14. 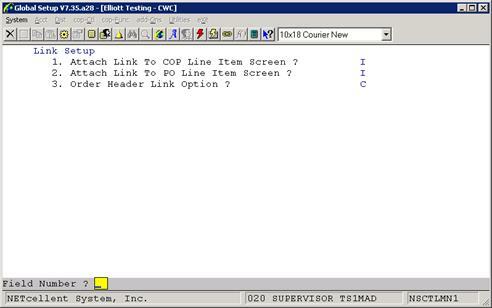 To display the reference in the Open Item Inquiry on a second line, place a “Y” in this field. Field 15. This controls the default value for the Show Open Items Only flag for the Aging Report. Field 16. We recommend you set this to “Y” only if you are using laser statements. This will eliminate the alignment window. Field 17. There are three options; “O” for the original print position of the customer address, “W” to move the address up two lines to fit a #9 window envelope, and “C” to move the address up four lines to fit the crash form.